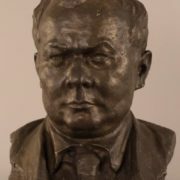 Soviet Russian sculptor Vladimir Domogatsky (1876 – 1939) – the teacher, professor of Moscow State Art Institute (since 1937), Honored Artist of the RSFSR (1937). Born into the family of a wealthy landowner, a doctor, he spent his childhood in Switzerland. In 1897-1902 he studied law at Moscow University and took private lessons in sculpture from SM Volnukhin, and later, the painter S.V. Ivanov. At the beginning of the 20th century he visited Paris and Italy several times, where he studied European art. 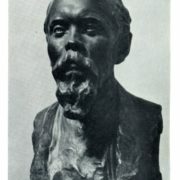 A special influence on his work had the sculptors Paolo Trubetskoy and Rodin. 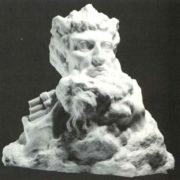 In 1907 in Paris he studied the technique of working in marble. After returning to Russia in 1908-1910 – he taught at the Stroganov School in Moscow. 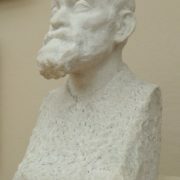 Since 1937 – Professor of the Moscow Institute of Fine Arts, Dean of the Faculty of Sculpture. 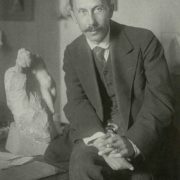 Among his students were prominent Soviet sculptors Lev Kerbel, Vladimir Tsigal, and D. Mitlyansky. 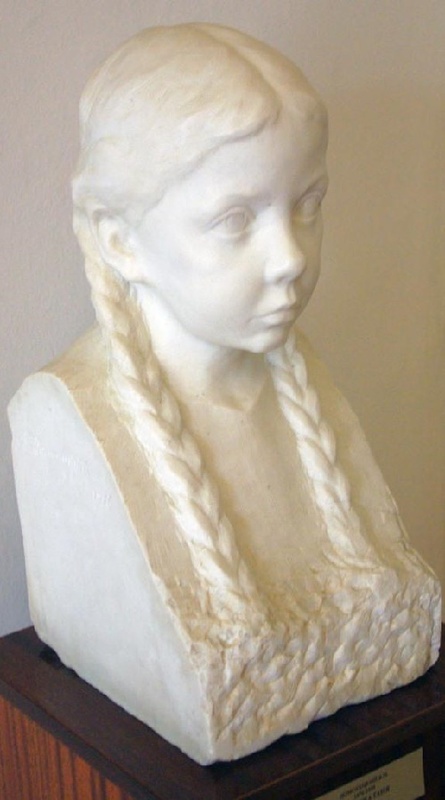 Meanwhile, he worked in genre of animalistic and portrait sculpture. 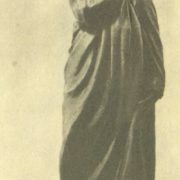 Noteworthy, most active creative, research and social activities Domogatsky showed in the post-revolutionary period, participating in the implementation of Lenin’s plan for monumental propaganda. 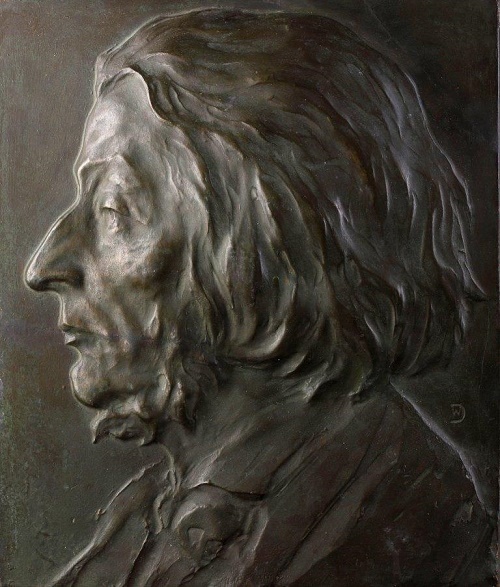 Continuing to work in the field of portrait genre, the sculptor performed portraits of V. Vatagin (1923), N. Semashko (1924), V. Veresaev (1929), and K. Marx (1931). 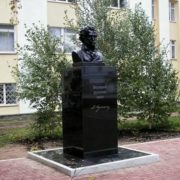 In addition, he took part in contests for the monuments to Alexander Pushkin and Maxim Gorky (1938), and also worked on the creation of a memorial sculpture in the spirit of the new era. 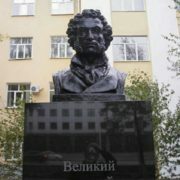 In particular, he performed gravestones to theater figures A. Sumbatov-Yuzhin (1928) and A. Petrov-Sergeyev (1934) at the Novodevichy Cemetery in Moscow. Meanwhile, the sculptor worked primarily in the field of portrait plastics. 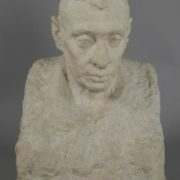 Particularly – self-portrait of marble (1925, State Russian Museum) and portrait of his son (marble, 1926, Tretyakov Gallery). 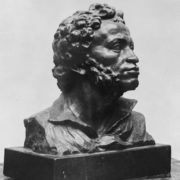 Domogatsky also addressed to the historical portrait (AS Pushkin and LN Tolstoy, bronze, 1928, All-Union Museum of Leo Tolstoy, Moscow). 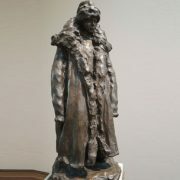 In addition, for some time he was in charge of the Department of Sculpture of the State Tretyakov Gallery. 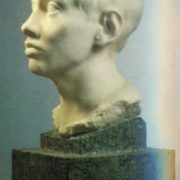 Also, participated in the preparation of articles on sculpture for the first edition of the Great Soviet Encyclopedia and for the Dictionary of Artistic Terminology. 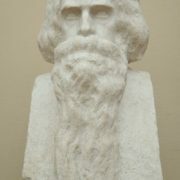 Engaged in theory and history of sculpture, he conducted experimental research work related to the technology of material, shape and texture in sculpture, and restoration. Besides, he wrote a number of theoretical articles.